The Cygnar side show continues. Each game, I'm trying new pieces and force mixes. I don't think I'm expecting to stumble upon an army list that is going to capture my imagination and make me rethink going back to Menoth for 2013...but it sure would be nice to win a game with Cygnar once in a while. But that just isn't happening. Here are a couple of games I've had with Elliot recently (he continues to gain experience and kills with Khador Conquest lists). Game One. We are playing Diversion, a radial scenario with a flag that must be controlled, and a zone that must be contested. Elliot's force, built around pIrusk. He has Widowmakers and Black Dragon Ironfangs. My Cygnar force. I'm trying out pHaley with Stormblades and the Black 13th. Elliot's turn 1. Elliot goes first. He runs the Widowmakers up on the bluff on his right flank. ...and everyone else crashing through the middle. My turn 1. I send the Black 13th up my right flank towards the flag and to maybe get in behind Elliot for an assassination run. The Stormblades advance on my left. I want to use Haley's feat to get six POW 14 weapon attachment shots. Elliot's turn 2. Everything goes bad for me. Elliot lands a crit devastation shot into the middle of my Stormblades. Three are killed outright and plenty are knocked down. The Conquest's small guns clean up a lot of knocked down Stormblades. My turn 2. I advance and get some covering fire templates out in front of the Ironfangs. I then get to work on Conquest. Big gun shots start doing their damage to Elliot's colossal, while Haley's Temporal Barrier prevents a quick enemy close to melee. Elliot's turn 3. His stuff snakes around the covering fire areas. He controls his flag, but needs to get a unit into my zone to contest and score a point. Not yet. My turn 3. Haley feats. I'm going to try an assassination run. Stormwall hammers Conquest and gets out more covering fire. Lynch from the Black 13th (as well as Watts) has a bead on Irusk, who is standing behind the Conquest. Under the feat, I have a good chance to assassinate with Brutal Damage shots. I miss all four attacks. Hmmm, that's pretty much game for me. Elliot's turn 4. The Ironfangs continue to inch towards the zone. Conquest shifts over to my right flank to get rid of the Black 13th's remaining members, and my Journeyman, who has moved up to try for the flag. My turn 4. There is a clear charge lane to Elliot's damaged Conquest. My hope is to smack up Elliot's colossal, then get to his caster before he scores his second control point. Elliot's turn 5. Unfortunately, Conquest survived my charge. During his turn, Elliot gets a bead on Haley, takes the shot, and that's all she wrote. Game Two. We decide to practice for this weekend's upcoming Year Long League finals. This will be a six round, three list event at 40 points. All scenarios are Gauntlet. Here is the set up. Elliot has eVlad on the start line with Conquest and Uhlans. I should be practicing with my Cryx, but I really want to get my 2nd Stormwall out on the table. So, I try a game with eNemo and some Stormcallers. Elliot's turn 1 (he is first player again). Elliot runs up his right flank and gets eEiryss in behind the building in the center of the picture. My game plan revolves around keeping Polarity Shield up on my forward Stormwall to attenuate the effect of eVlad's feat. eEiryss will quickly foil this plan, so she must die immediately. My turn 1. I Energize the Stormwalls forward, get Polarity Shield up on my left flank colossal, and then pray I have the range to get a Lightning Pod on eEiryss. I activate my right flank Stormwall and get covering fire templates out. Then, I active the left flank Stormwall, run and launch a Lightning Pod. I am just out of range to catch Eiryss. My fate is sealed and the game has barely begun. Elliot's turn 2. eEiryss moves up and knocks Polarity Shield off my forward Stormwall. eVlad feats, affecting all his Uhlans. The Uhlans charge and wreck the first Stormwall handily. I'm sad. My turn 2. I'm sunk, but I go ahead and kill several Uhlans and eEiryss with my second Stormwall. Elliot's turn 3. What does it matter? Conquest charges Stormwall (with help from surviving Uhlans), and my second colossal goes down. I concede. Elliot had made an easy guess that I'd be bring out two colossals to this game (I'd just finished painting my second one). So he brought the perfect armor-cracking list for it and added in eEiryss to get rid of the defensive buffs. He had the right formula, and I feel I only stood a chance if I could get rid of Eiryss right away. As it turned out I was just out of range for this and the end was inevitable. Dang...I should have played Cryx. Good game anyway! OK...ready to get back to Menoth very shortly. I was in Normandy last spring and learned a lot about the Canadian contribution to the Allies D-Day effort. Since that time, I've been collecting models for a Canadian Normandy game, to be put on some time in the future. I've finally gotten around to assembling and painting the 1/56 scale M4A4 Sherman from Die Waffenkammer (JTFM Enterprises). The JTFM line is reputably the best 28mm series of WWII vehicle models you can get. I really haven't seen enough examples from different manufacturers to render a judgement, but I was pretty pleased with this resin tank. Nice sculpt with good proportions. Fair cast (a little soft around the bogies). No air bubbles in the resin. Step 1) After cleaning up the cast (there was a minimum of flash), I primed black. Step 2) Spray Vallejo US Olive Drab. Step 3) I modulated the surface by overspraying a couple of lighter shades towards the center of each flat surface. The color progression I used was US Olive Drab, Light Grey Green and Hemp. Step 4) Overspray with Future floor wax, then add the decals/markings. The kit did not come with decals, so I went to the spares box for a lot of these. In terms of the vehicle being modelled, I wanted to do a representative Canadian Sherman from Normandy. So, I chose a tank from The Fort Garry Horse. This is vehicle 42, B squadron, 10th Armoured Regiment, 2nd Armoured Brigade, 1st Canadian Army. The Fort Garry Horse fought alongside several different regiments from the 3rd Canadian Infantry Division during the Normandy campaign...starting with the landings on D-Day. This would be a vehicle fighting inland through June and July, 1944. Step 5) Weathering. After a spray of clear flat to seal in the decals, I used a combination of weathering pigments/rubbing alcohol and splattered acrylic mud colors. I also painted up the stowage and glued that onto the hull as well. In this shot you can see a bit of cheese cloth I added as a piece of rolled up netting. And finally, a rear shot. Not a bad kit. I enjoyed painting the guy up and got some satisfaction out of researching the particular unit this tank belonged to. So I got it into my head that I wanted a second Stormwall. Don't ask me why...I've played several games with my new Cygnar forces and still can't win a damn game. But the Stormwall is just so cool...maybe two will be the thing I need to start winning with this faction. Here the major assemblies are put together, primed black, and then the appropriate areas are sprayed blue and white. Next, the bronze and steel areas are done. And before you know it...well, it did take a fair bit of effort at this stage. Electrical coils, then paint chip weathering, then final assembly followed by spray weathering. Finally, the basing is completed and we're all done. As you can see, I tried to match the paint style as closely as possible to my other Stormwall (painted by Jarrett Lee). A fun project, and now I can try two of these on the game table. Finished up some more micro armour pieces for the Gazala battles scenarios I'm thinking of running down at the club. First up are Matilda IIs. In '41 these would have had the sharp three-tone scheme...but in '42 they were simply in desert sand. Panzer III Js. These would have been called Mark III Specials (because of their long 50mm guns) by the British in '42. PSW 222s and a 223. German armored cars. SdKfz 7 prime movers and a few command cars and truck. Time for another Cygnar update. This week, I've got pics of a couple of new heavy 'jacks; the Stormclad and Centurion. The Stormclad is, well...as far as I can tell...Cygnar's best heavy. It's fast, is the hardest hitting melee 'jack and tosses in a good ranged attack just because. With Kraye, this guy can alpha strike at 17" under the feat...and hit very hard. On the other hand, the Centurion seems to be Cygnar's best defensive heavy. He can't be charged and starts the game at 21 armor. A pretty strong option to hold a scenario point. Off to a Steamroller tomorrow and hoping for good things from eSkarre. Well, it's that wonderful time of year again...the return of standard time. Goodbye daylight savings time; hello one extra hour of the day! They are a new addition to my growing Cygnar army and are intended for use with pHaley...to take advantage of her feat, Blitz. Hope you were able to do something cool with your extra hour today. Enjoy! 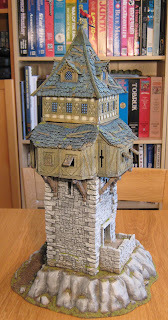 There is an outstanding model structure outfit in Croatia called Tabletop World. You can find their website here. I learned about them well over a year ago from a Beasts of War channel video. I was intrigued by the product, so I thought I'd order one of their buildings and see what it was like for myself. 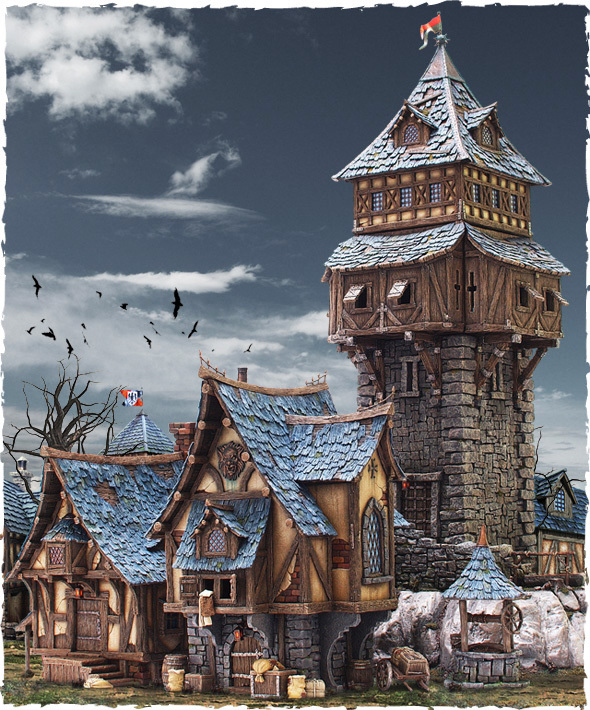 Here's a photograph of some of their medieval structures from their home page. Pretty snappy stuff! 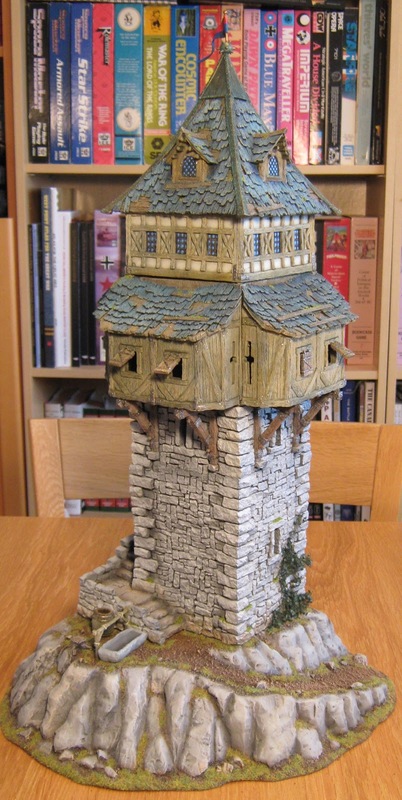 I ordered the Guard Tower (and hill)...and here's how it comes. Lots of pieces, and hardly a mold line in sight. The resin is very clean and free of bubbles. Absolute top quality castings. Now, I've been working on this project on-and-off for a year. It has literally sat for months at a time in the basement untouched. Well, this week I resolved to finish it off. The main structure anyway. There are lots of furniture bits to fill the rooms...I haven't quite finished those yet. Anyway...the finished model. And again. The whole model is stunning. Quite the centerpiece for a game table. I'm thinking Warmachine. The ramp up the hill. There is an outrageous amount of detail sculpted into this model. I've added some moss to complete the rundown look of the structure. 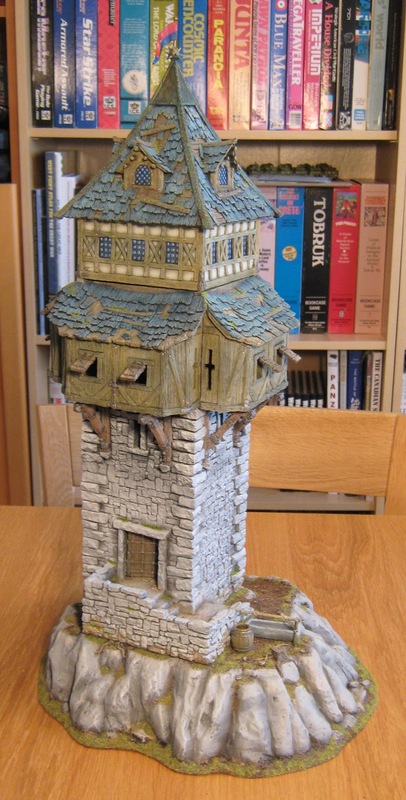 All the rooms of the Guard Tower are accessible and quite nicely detailed. Here it is with the roof off. As I said, there's a lot of model furniture that come with the kit...not quite done yet if you know what I mean. The upper storey removed. This is the main guard chamber. There are nice crossbow slits and covered windows on this level. The upper chamber of the stone tower. And finally, the bottom section of the tower. All the stairs were separate sections to facilitate easy painting. I added some Army Painter ivy to one side of the structure. 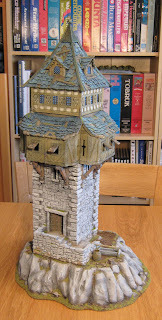 Also added some moss to the tower stone in various places. Anyway, as you can see, a superb model. 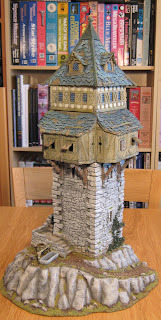 I really like Tabletop World stuff, and now have a fair number of their other models as well. Graveyard is the next project.